Restylane Silk is the newest HA (hyaluronic acid) soft tissue filler to gain FDA approval. While it gained its FDA approval in June 2014, it has been used in Canada and Europe for several years. Restylane Silk is the newest filler in the family of Restylane products, and is formulated with lidocaine for added comfort during treatment. Dr. Greene serves as a key opinion leader and national trainer for Galderma and Allergan, and trains other physicians on proper injection techniques using Restylane Silk, Botox, Juvederm Ultra, Juvederm Ultra Plus, and Juvederm Voluma. As a prominent leader in injectable treatments, Dr. Greene was selected by Galderma as one of the first physicians in South Florida to offer Restylane Silk. The loss of volume is one of the hallmarks of facial aging. This occurs in varying degrees of severity, and can lead to significant changes in the facial appearance. One of the most noticeable changes is the loss of cheekbone definition. Historically, this was addressed with surgery to tighten the overlying skin and lift the deeper soft tissues. More recently, volumizing fillers have been used to provide a similar ‘lift’ without surgery. The goal is to restore volume in the midface to create a natural, youthful face. Restylane Silk is the first filler formulated with lidocaine that is FDA approved specifically to for rejuvenation of the lips and lines around the mouth. Like the well-established Restylane filler, Restylane Silk is a hyaluronic acid (HA) filler made from long chains of sugars that occur naturally in the skin. It is uniquely formulated and cross-linked to create a softer consistency that fills in lines with a very natural look. And since it is an HA filler, it can be carefully molded and shaped into the desired contour after injection. WHO IS A CANDIDATE FOR RESTYLANE SILK? Virtually anyone who desires non-surgical lip augmentation, as well as smoothing out fine lines and wrinkles, is a candidate for treatment with Restylane Silk. This treatment can be performed safely on patients who desire immediate correction without surgery. Patients who are unable to undergo surgery due to underlying medical issues often find these non-surgical treatments to be an excellent alternative. WHAT CAN I EXPECT WITH A RESTYLANE SILK TREATMENT? Dr. Greene’s specially formulated topical numbing cream is applied for 15 to 20 minutes prior to treatment. Treatment takes approximately 15 to 30 minutes to perform. The treatments involve very small needles, and are virtually painless due to the numbing cream and Dr. Greene’s gentle injection technique. In fact, Dr. Greene is well known in the South Florida area for his gentle technique. After Dr. Greene injects the Restylane Silk, he then gently massages the area to ensure that it is properly distributed. Patients may return to normal activities immediately after treatment. Dr. Greene is an injectable specialist who is considered to be a leading expert in facial fillers. He is a national trainer for both Galderma and Allergan and trains other physicians how to properly inject Restylane Silk, and he was selected as one of the first offices to obtain Silk. Dr. Greene takes an innovative anatomic approach to filler treatments, which leads to more natural, long lasting results. As one of the top injectors in Florida, he customizes treatments for each patient, which often includes a combination of different fillers and techniques in order to achieve the best outcomes. A major emphasis of Dr. Greene’s practice is non-surgical filler treatment of the face. He has also published and lectured extensively on Botox and injectable fillers, and he was a contributing editor for a textbook on Botox and hyaluronic acid fillers (Restylane and Juvederm). Restylane Silk is a facial filler made up of hyaluronic acid, a naturally occurring substance in the skin that helps to bind water to cells. The unique formulation in Restylane Silk helps to provide a very natural lifting capacity to the skin, ideally suited for the lips and lines around the mouth. WHAT ARE THE GOALS OF A RESTYLANE SILK TREATMENT? Patients who are good candidates for treatment either desire more fullness of their lips or a lip rejuvenation. 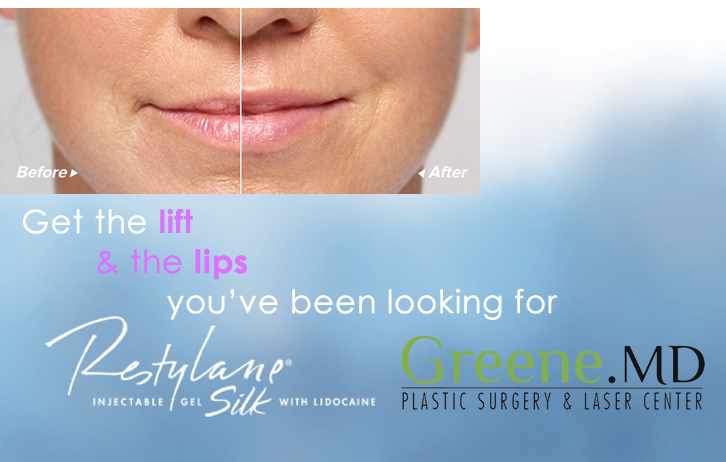 Using small amounts of Restylane Silk filler placed correctly, natural lip fullness can be created. However, many patients do not desire fuller lips, but would rather like to rejuvenate the lips and eliminate the fine lines around the mouth. This can also be accomplished, with no significant change to the size of the lips. Rather, this type of lip rejuvenation will serve to define the lips, rather than augment them. DOES RESTYLANE SILK TREATMENT OF THE LIPS LOOK UNNATURAL? One of the major misconceptions about lip filler treatments is that the results look unnatural. While in inexperienced hands this can certainly occur, a proper lip treatment result should always look natural. WHAT SHOULD I EXPECT AFTER A RESTYLANE SILK INJECTION? Results are immediate and typically last for several months, and often up to one year. The duration of filler correction depends on the facial area treated, the injection technique, and the rate that the patient‘s tissues break down the filler. The majority of patients can resume their daily activities immediately after treatment. Some patients may experience slight swelling and bruising, but this typically improves rapidly. IS THERE ANY DOWNTIME AFTER A RESTYLANE SILK INJECTION? There is no downtime after treatment, and patients may return to their normal activities. In some patients, there are temporary side effects, such as minor swelling and bruising, but these are usually mild. WHAT ARE THE COMMON SIDE EFFECTS OF A RESTYLANE SILK TREATMENT? Side effects are generally minor, such as bruising or mild swelling, and can be easily concealed with makeup. Avoiding certain medications and supplements, such as baby aspirin and fish oil, can minimize bruising. HOW DO I KNOW IF RESTYLANE SILK IS RIGHT FOR ME? To learn if Restylane Silk is right for you, Dr. Greene will perform a thorough consultation. Dr. Greene has experience with a number of different fillers, and will select the best filler combination for you. CAN RESTYLANE SILK BE REMOVED OR DISSOLVED? One of the major advantages of Restylane Silk is that it is composed of hyaluronic acid (HA). If necessary, HA fillers can be dissolved with an enzyme in a very simple procedure. Experienced injectors like Dr. Greene rarely need to remove any filler following injection, but this is a benefit to have as a potential option. DOES RESTYLANE SILK REQUIRE ANY SPECIAL TRAINING OR EXPERIENCE? All facial fillers require extensive experience in order to achieve the absolute best results. Use of a filler such as Restylane Silk requires experience and advanced understanding of anatomy of the face. 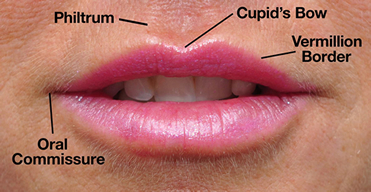 There is significant variability among patients’ anatomy and each treatment is unique, requiring a trained eye and artistic understanding of the lips and surrounding area. Dr. Greene serves as a national trainer for Galderma in order to train others how to safely and properly inject Restylane Silk. ARE THE TREATMENTS WITH RESTYLANE SILK PAINFUL? Patients usually report only minimal or mild discomfort during treatment. Dr. Greene uses a specially formulated numbing cream that alleviates most discomfort. Restylane Silk is formulated with lidocaine to enhance patient comfort. CAN RESTYLANE SILK BE COMBINED WITH OTHER FACIAL FILLERS? Restylane Silk is often used with other facial fillers during a patient’s treatment. In fact, Dr. Greene often uses different fillers for the same patient in order to achieve a more natural result. While Restylane Silk can be used safely in most areas of the face, it is ideally suited for the lips and areas around the mouth. WHAT AGES ARE MOST APPROPRIATE FOR TREATMENT WITH RESTYLANE SILK? While theoretically any patient with deficiency in the lips and/or perioral area (around the mouth) could benefit from Restylane Silk treatment, there are some important principles to understand when it comes to selecting appropriate patients for Restylane Silk treatment. Younger patients with minimal volume loss may desire more fullness to their lips, while older patients often want to rejuvenate and enhance the area around the lips, eliminating the fine lines and sunken look. Regardless, there is no absolute age limit for Restylane Silk treatment.